average discharge 42 m3 / sec. New Melones Lake is the fourth largest reservoir in California, boasting a total water volume of 3 km3 (about 2.4 million acre-feet). 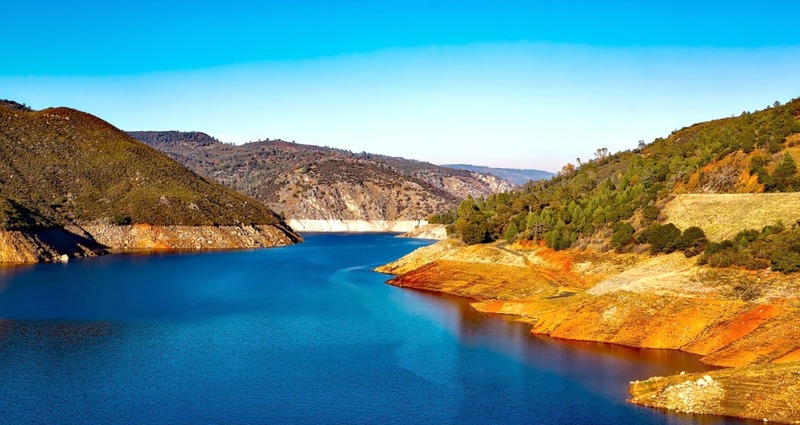 It is located in the central Sierra Nevada foothills on the Stanislaus River, in Calaveras County and Tuolumne County, west of Jamestown and Sonora and south of Angels Camp. New Melones Lake has a surface area of 51 km2 (20 mi2), and reaches a maximum depth of 173 meters (568 feet). When the reservoir is full, it has a shore length of more than 100 miles. The reservoir was created by the building of the New Melones Dam as part of the Central Valley Project, and provides power, irrigation water, wildlife habitat, and flood control. The reservoir is crossed by the Archie Stevenot Bridge, which was completed in 1976, and carries Highway 49 over the lake. New Melones Lake is very popular for outdoor enthusiasts of every age, and it attracts around 800,000 visitors every year. It is particularly popular among people living in central California, from Merced to Sacramento and the Bay Area. The main activities here include boating, fishing, camping, hiking, and biking. There are 2 recreation areas: the Glory Hole Recreation Area and Tuttletown Recreation Area. The shores of the lake are also home to camping sites, marinas, and boat launches. Hiking and biking enthusiasts will be happy to find out that there are plenty of trails around New Melones Lake. The most developed trails can be found in the Glory Hole Recreation Area, but there are also others around the lake’s shoreline. You will also find all difficulties here, from easy to challenging, perfect for soaking in the amazing natural scenery around the lake. There are 6 boat launches on the lake, but bear in mind that they can become congested on holiday weekends, so plan on arriving early. Taking a boat out on the lake will give you a firsthand look at this beautiful and large lake and its diverse wildlife. You will also have the option of renting a houseboat at New Melones Lake, giving you the opportunity to explore the lake in luxury. The smooth water of the lake is perfect for waterskiing, jetskiing, and wakeboarding. Kayaks, canoes, sailboats, and rafts are common on the lake. New Melones Lake is usually not very crowded, it has a surface like glass, which makes it ideal for water ski enthusiasts. Jet skiers are able to explore an abundance of coves and creek channels. The general configuration of the lake and its size insures that boaters, skiers, and anglers can share the lake without crowding one another. The sheer size of New Melones Lake makes it an ideal outdoor destination, because it is less crowded than other lakes in Gold Country. Photo credit: Dave Parker on Flickr. Fishing at New Melones Lake is a delight for anglers. The waters of the lake are cool and clean, providing a great habitat for rainbow trout, brown trout, smallmouth bass, largemouth bass, spotted bass, redeye bass, kokanee, black crappie, channel catfish, and bluegill. You can either bring your own boat or rent one from a marina, and make sure you have a valid California fishing license. From Thanksgiving until February, when the trout are gorging, anglers can catch beautiful rainbow and brown trout from the shore. During the summer, boaters can use minnows or night crawlers with lights to attract baitfish, which in turn attract trout. The lake is open to boaters all night long, and it’s incredible to spend the night under the stars with the water around you shimmering. From spring to fall, bass action is hot, while during summer and fall you can catch catfish in the 3-30 pounds range, sometimes even larger. Perch and crappie can be caught during the summer using jigs and minnows. Kokanee were introduced into the lake in 1997, and have thrived here ever since. A relative of the salmon, some people believe they are the best tasting freshwater fish. You can catch kokanee during the spring and the summer. Wildlife is abundant around New Melones Lake. Osprey hawks nest in the trees that surround the lake, and bald eagles are common during late winter and spring. Other common birds here include egrets, herons, teal and mallard ducks, Canadian geese, and coots. During the evenings, you can pretty easily spot black tail deer, raccoons, and foxes on the shores of the lake, as they come to quench their thirst. Turtles can be seen on logs at the water’s edge. If you are in luck, you might also spot a shy river otter. The region has been populated for more than 3,500 years, and the area around the lake is abundant with incredibly interesting archaeological and cultural sites. Miwok Indians arrived here about 500 years ago. Bedrock mortars and Indian petroglyphs can be found on the banks of the Stanislaus River. The start of the Gold Rush brought dramatic changes to the Stanislaus River. Since the site of the reservoir is at the heart of Gold Country, development began here as early as the 1840s, when the first miners arrived. As the riverbeds were scoured for gold, water was diverted and the banks were colonized by miners and businesses. By the early 20th century, flowing water was used to created electricity, and some of it was also diverted for agricultural use in the San Joaquin Valley. The original New Melones Dam was completed in 1926. In 1944, the New Melones Project was authorized, and it was meant to create a much larger reservoir and a new hydroelectric plant. One of its main purposes was also to prevent floods. The project was highly controversial. Its opponents argued that it would cause the river valley to be inundated, destroy natural whitewater rapids, flood unique limestone cave formations, and destroy archaeological resources. As a result, the environmental organization Friends of the River was created to fight the building of the dam. Archaeological surveys made by the Smithsonian River Basin Surveys and regional universities concluded that the dam could be built. When the dam was completed, the water covered the old mining town of Melones, as well as the smaller original dam. The dam is 625 feet high, and was built by the U.S. Army Corps of Engineers. It was completed in 1979 and transferred to U.S. Bureau of Reclamation shortly after. If you want to learn more about the region’s history and its cultural and natural background, you should visit the New Melones Visitor Center and Museum. You will be able to find out about how the Stanislaus River was used by prehistoric and historic peoples such as the Miwok Indians, the changes it has undergone during the California Gold Rush, and much more. There are also exhibits that highlight the area’s natural history, its geologic past, and the New Melones project. The Visitor Center and Museum are open Memorial Weekend through Labor Day, 7 days/week, from 10 A.M. to 4 P.M. From Labor Day through Memorial Weekend it is open 5 days/week, during the same hours, and is closed on Mondays and Tuesdays. From Sacramento: drive 46 miles South on I-5 to Stockton. Then drive east for 56 miles on California Highway 4, to Angels Camp. From Angels Camp, go South on Highway 49, which reaches the lake.